This is another collaboration effort with my wife. 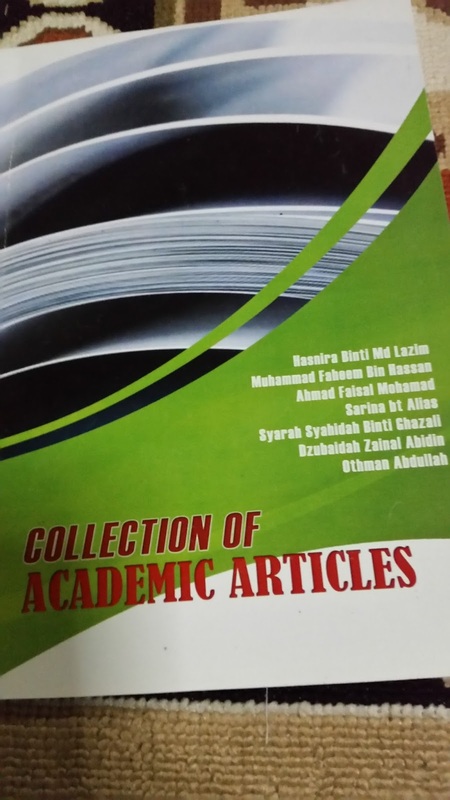 This paper, Musharakah Mutanaqisah, the Contract Elements and its Implementation in Malaysian Home Financing Products was published in the collection of academic articles by Kolej Polytech Mara (KPTM).
" Musharakah Mutanaqisah is an Islamic equity financing instrument. It is a form of partnership in which one of the partners promises to buy the equity share of the other partner gradually until the ownership of the subject of the Musharakah is completely transferred to him. However, the buying and selling agreement must be independent of the partnership. Shariah forbids the contract of partnership is entered as a condition for the contract of buying and selling. 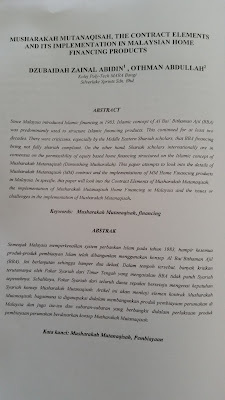 Musharakah Mutanaqisah contract is a combination of two (2) contracts, Musharakah and Ijarah which have to be concluded separately. Shariah scholars internationally including Bank Negara Malaysia Shariah Council and AAOIFI, are in consensus of the permissibility of the contract. From Shariah contract perspective, Musharakah Mutanaqisah is a binding contract. The contract comprises the elements of sale and lease which are binding and create a constructive obligation on the contracting parties. The obligation is created on the party who has agreed to buy the share of his partners and therefore he is required to pay the price of the shares. The financier, on the other hand, is also obliged to sell his share to the customer according to the ratio that has been agreed upon at the beginning of the contract. Musharakah Mutanaqisah contract and its implementation in Malaysia as a Home Financing instrument is still a long way to go. It only started in 2006 with only seven (7) banks so far are offering this product. Since Musharakah Mutanaqisah is more globally accepted compared to BBA Home Financing which is more prevalent in Malaysia, the motivation for Malaysian banks to offer Musharakah Mutanaqisah based products is very clear. To make Malaysia a global hub in Islamic Finance industry, it is crucial for Malaysia to offer products that are aligned to globally accepted Islamic principles. However, banks in Malaysia are still quite slow in adopting Musharakah Mutanaqisah. Instead migrating to Musharakah Mutanaqisah based financing, banks in Malaysia seems to be moving towards Commodity Murabahah based financing which is another debt based financing. At least two banks, KFH Malaysia and Citibank Malaysia, have discontinued their Musharakah Mutanaqisah based home financing products. One of the key reasons, there are still a number of unresolved issues if these banks were to strictly follow the rules of Musharakah Mutanaqisah contract. It is not that it is impossible. But, to implement it within the existing banking framework and legal regulations, operationally there are some challenges. Bankers have to change their mindset to be more “landlord” likes. One of the main considerations for banks to offer Musharakah Mutanaqisah is the risk management aspect. The application of Shariah principles in Musharakah Mutanaqisah contracts creates distinct relationships, rights and obligations of the parties to the contracts. As a result, banking institutions are exposed to both market risk associated with the joint ownership of the underlying asset, as well as credit risk associated with the obligation on the part of the customer to acquire, and on the banking institution to sell, its share of ownership in the asset. Therefore, banks will have to have a more robust risk management system. Although there are some issues and challenges for banks to offer Musharakah Mutanaqisah, these should not discourage them. 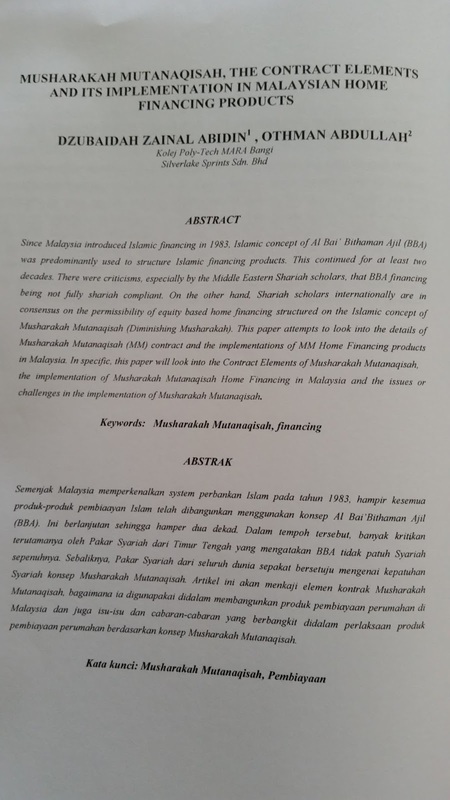 Rather, a more collective efforts needs to be put in place to address these issues/challenges so that the Home Financing Products based on Musharakah Mutanaqisah principle will become more popular especially because the contract is more in line with higher objective of Shariah as proven by global acceptance of Shariah scholars on the permissibility of the contract."